You can import users from other applications into MIDAS via MIDAS Admin Options → Manage MIDAS → Database → Database Tools → Import Data. Using the import tool, you can import user data into MIDAS v4.06 or later, that is either in a .csv (Comma Separated Values), or .txt (Tab, or other character, Delimited) file format. 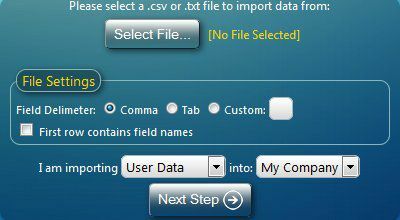 Before clicking the "Next Step" button, be sure to specify that you are importing user (and not client or booking) data. 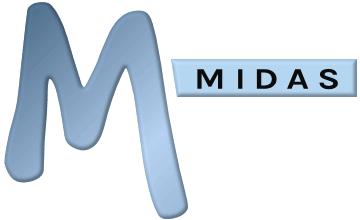 At the top of each column in the table is a drop-down list allowing you to "assign" each column to a specific user field within MIDAS. For example, if the first column of your data file contains email addresses, select "Email" at the top of this column. Do this for all columns you wish to import. If your data contains columns, that you don't wish to import data from, select the <Don't Import> option from the drop-down at the top of these columns. Once you have assigned your columns to their corresponding fields within MIDAS, you can then specify the user account options & permissions that are to be initially assigned to all the accounts you are importing. Please refer to the help documentation for detailed descriptions of the various account permissions available here. In addition, if you are not importing passwords for your new accounts, you can tick the "Generate a random password for each user", and the importer will generate a random password for each new account imported - If you select this option, you should also consider selecting the "Auto send User their Login details via email" as well. That way an automated email will be sent to each imported user notifying them of their initial login credentials for the system. Finally, once you've defined the initial settings and permissions for the accounts you're about to import, choose which database you wish to import the data to (if you're running multiple databases from a single MIDAS interface), and then click the "Import Data" button.